Wild in North Dakota is a registered 501c(3) tax exempt ND non-profit corporation. Hope you are all enjoying a fine summer day! This is one of my favorite photos from my last trip to TRNP as it is so simple yet says so much to me. 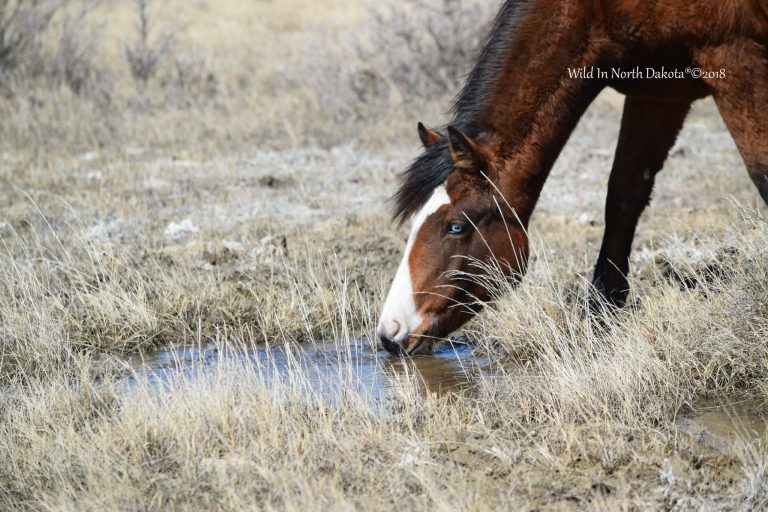 It is of the adorable 2017 Filly Elsa (Nordie x Half Moon) as she took a moment to drink from a fresh clean puddle out in the North Dakota prairie. I love the way her blue eye pops and the way the grasses frame her eye. She is a little cutie so hope you enjoy the simple beauty of this young filly running wild and free in Theodore Roosevelt National Park! Enjoy!